I am offering full card analysis for both Breeders’ Cup Days. I have included a free play of Friday’s Grade I Breeders’ Cup Juvenile Turf below. Each full card costs $10 and includes analysis of all races on Fri-Sat, horse-by-horse analysis of each Breeders’ Cup entrant, wagering strategies for all races, and suggested Pick 6 Tickets using DRF TicketMaker. Both full cards are complete and ready to purchase on my Today’s Racing Digest Handicapper page. If you are not a Digest member, you can create a free account. My HorseRacingNation.com colleague Mike Shutty is also selling his informative Super Screener product again. Check it out at SuperScreener.com. You can also my purchase Breeders’ Cup analysis directly through me. Send an email to calkid692002@yahoo.com for more information. Click here to purchase my Breeders’ Cup 3013 analysis. SA 7 (G2 BC Juvenile Turf) – Horse comments and wagering strategies below. #4 OUTSTRIP (4-1) – Ran well in all four 7f turf starts in GB for Godolphin. #5 Bobby’s Kitten (5-2) – Freaked in G3 Pilgrim for Chad Brown and I like his running style versatility. #11 Poker Player (12-1) – Packs nice late punch on turf/synthetic for productive Hill-Catalano team. #2 Giovanni Boldini (7-2) – 2-for-2 in overseas synthetic races at 7f. 3rd of 5 in lone turf try. #13 Bashart (6-1) – Consistent Pletcher runner owns early-pressing versatility. #8 Bon Accord (20-1) – Rallied for show in G3 Bourbon (off the turf). Won lone turf try (Calder). #7 Aotearoa (12-1) – Smart win in Zuma Beach but these are better. #3 Got Shades (30-1) – 2-time LAD turf stakes winner finished 3rd in Zuma Beach. #12 Shamshon (12-1) – Won a pair of 5f overseas turf sprints but did not have answer at 6f last time. #9 Wilshire Boulevard (8-1) – Busy 7-race overseas campaign produced two wins. #6 Home School (30-1) – Former Ireland runner was 3rd in OT Juvenile Turf and 4th in Zuma Beach. #10 Ontology (30-1) – Oak Tree Juvenile Turf runner-up is still a maiden after 5 starts. #1 All Cash (30-1) – Finished a troubled 4th in the G3 Bourbon and was 3rd in both turf starts. Lukas runner is a maiden after four starts. aroaalist flopped in lone dirt try. at Pants On Fire in Penn Mile. Strub Series. llying show finish. 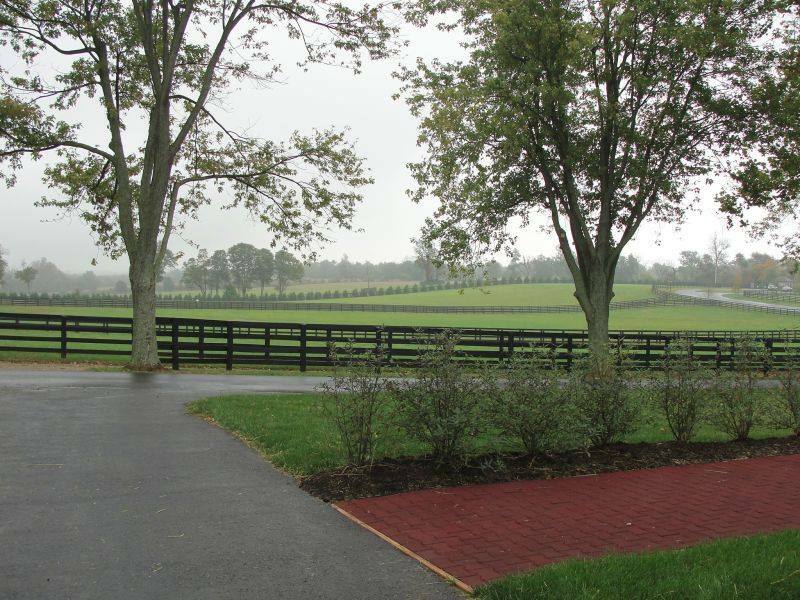 We recently visited WinStar Farm in Versailles, KY. This is my second in a 3-part blog series. In this edition, I will look at the Training Barn. 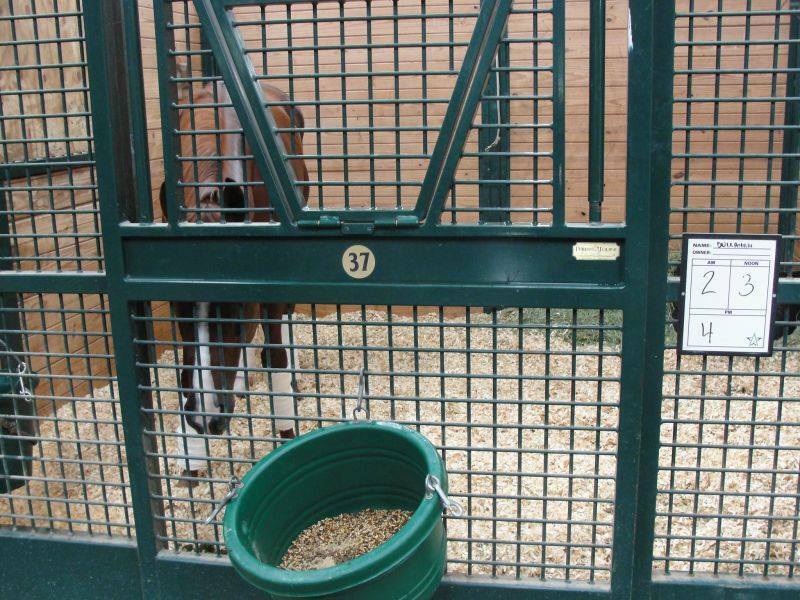 In addition to housing top class stallions, WinStar has a great training center and rehab facility. 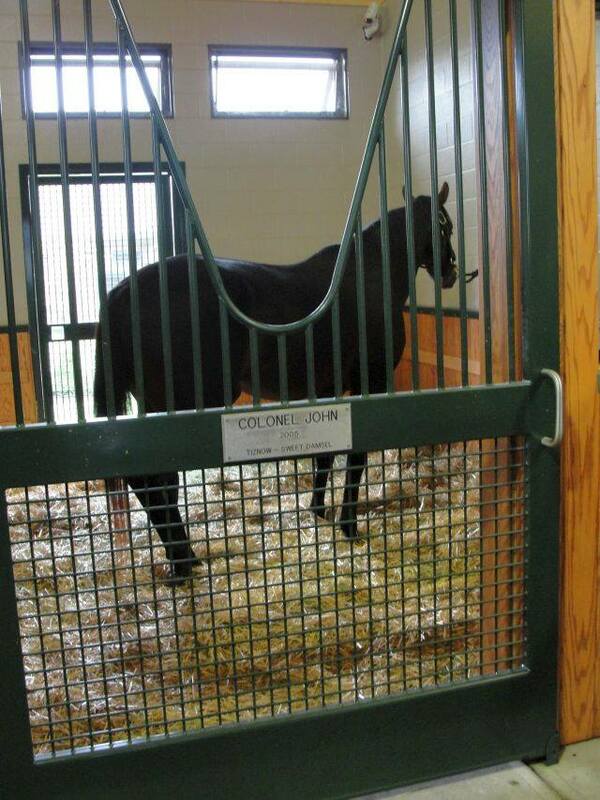 In Part 1 of this blog series, I talked about seeing my losing Derby selections Colonel John and Pioneerof The Nile in the Stallion Barn. After visiting the studs, we hopped over to the Training Barn, and the first horse I see is my losing Kentucky Derby 2013 pick Revolutionary. C’mon WinStar, you’re torturing me! Revolutionary actually ran a fine race to land the show in the Derby. He skipped the Preakness and appeared loaded for bear in the Belmont Stakes but finished a flat 5th and has been at WinStar since. He has a ton of raw ability and could have a big 4-year-old campaign for Todd Pletcher. 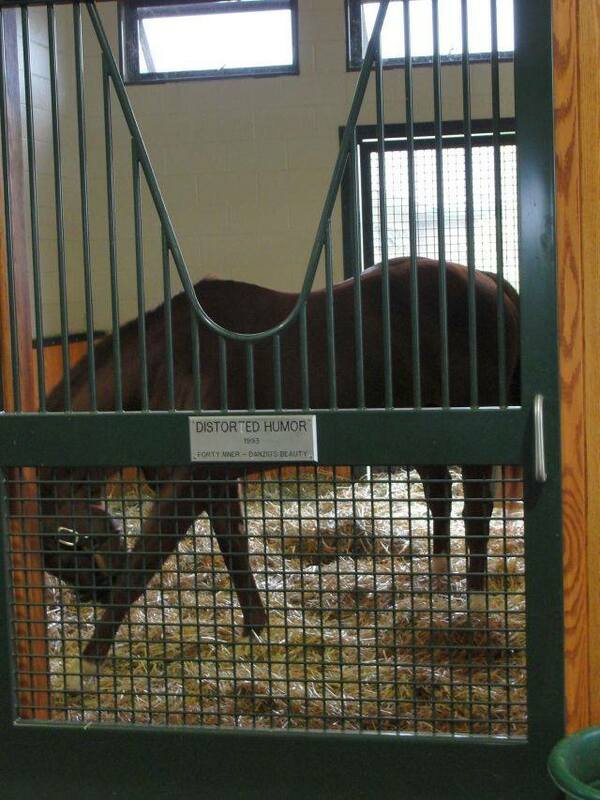 Another Kentucky Derby 2013 participant, Normandy Invasion, is also rehabbing at WinStar. 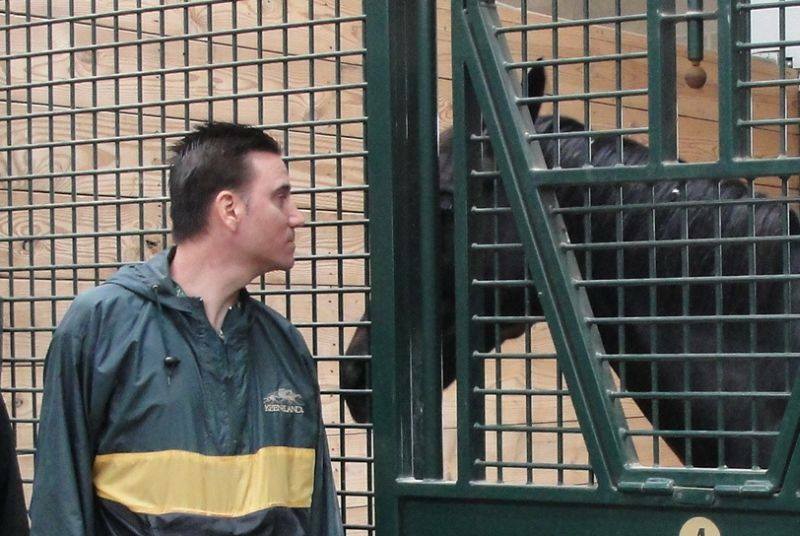 He checked in right behind Revolutionary on the first Saturday in May and has not raced since. He will likely rejoin the Chad Brown barn in Florida this winter. The Training Barn was also full of promising juveniles, including Holy Soldier (Colonel John – Dance Swiftly, by Danzig), Race Day (Tapit – Rebalite, by More Than Ready), and The Trunk Monkey (Old Fashioned – Susquehanna River, by Trippi). Unraced 2-year-old filly Sweet Dreamer (Tiznow – Dream of Summer, by Siberian Summer) is worth following. She is bred to be a good one. Graham Motion has Queenie’s Song (Unbridled’s Song – Queen of Money, by Corporate Report) at WinStar. The promising juvenile filly graduated in her Aug. 21 Presque Isle debut and finished 2nd in a Keeneland allowance race Oct. 9. In the coming weeks and months, I will be following the progress of the horses I saw at the WinStar Training Barn right here on the blog. – stay tuned! 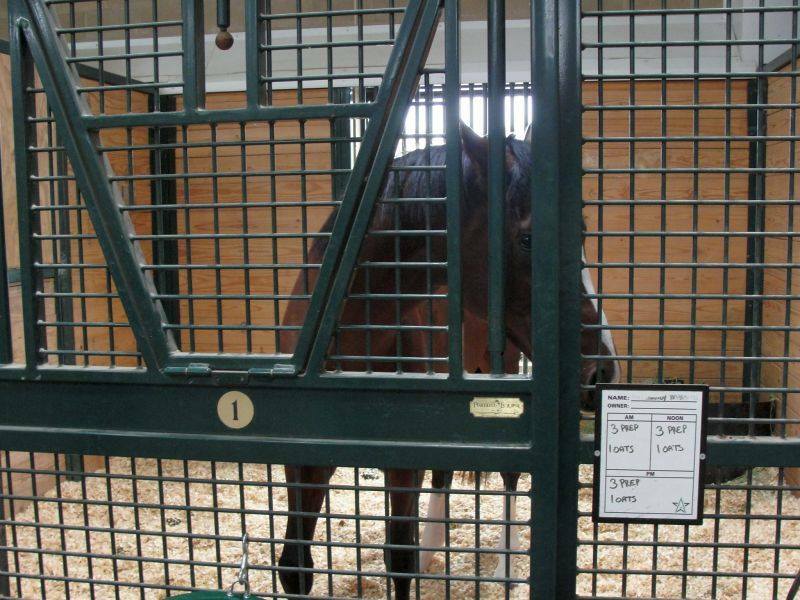 In Part III of this series, I will take a behind the scenes look at the WinStar training and rehab center. Todd Pletcher’s top early Kentucky Derby 2014 contender Havana followed up a sharp debut maiden win with a game neck victory in the Grade I Champagne Stakes at Belmont Park on Saturday, October 5. Havana dueled through honest splits of :22.87 and :45.54. He opened up a 2-1/2 length lead after six panels in 1:10.12 and widened his advantage to 4-1/2 lengths in the lane. The Champagne was not ready to be uncorked with Honor Code was flying home on the outside, but he came up a tad short in a gallant effort. Ride On Curlin was well clear of the rest in 3rd. The final time was 1:35.81, which translated to a solid 93 BSF. We Miss Artie is a Grade I winner on paper after capturing Keeneland’s Breeders’ Futurity, but he only received a 70 BSF for his winning effort. He needs to run much faster if he expects to be competitive on Breeders’ Cup day. Sunday’s Grade III Grey Stakes winner Ami’s Holiday garnered an 80 BSF against three opponents. This is only my second Kentucky Derby 2014 contenders blog, and at this early stage, my original “exceptional eleven” contenders remain intact despite some disappointing efforts. Ride On Curlin ran fast enough to be considered and will have every chance to join my list with another strong performance. Latest Workout: Breezed 4f in :50.80 (50/65) at Churchill Downs on 10-12. Comments: 3rd behind Honor Code and Misconnect in Aug. 31 Saratoga debut and raced green that day. He overcame adversity to earn diploma at Churchill Downs (one mile) on 9-28. Comments: Made up more than 20-lengths in his career debut (Saratoga slop) to score by 4-1/2 lengths at 7f on 8-31 (89 BSF). He rallied to miss by a neck in the G1 Champagne on 10-5 and will skip the G1 BC Juvenile in favor of the G2 Remsen at Aqueduct on Nov. 30. Comments: Went wire-to-wire in his Saratoga debut on 8-23 and earned a 102 BSF. Put away Debt Ceiling and Grand Arrival early, and held off Honor Code by a nose in the G1 Champagne (93 BSF) at Belmont on 10-5. The BC Juvenile on 11-2 is next. Latest Workout: 4f bullet in 4f in :47.80 (1/27) at Santa Anita on 10-8. Comments: Rallied for 3rd in his 5.5f Del Mar debut 8-17 and won by 1-3/4 lengths (one mile) at that same venue 8-31. Comments: Finished 5th in his 7-22 Saratoga bow. He graduated by 4-1/2 lengths at 6.5f at the Spa on 8-17 and cruised by 9-3/4 in the G1 Hopeful at 7f (mud, sealed) on 9-2 (85 BSF). He never got untracked in 7th place Champagne puzzler and will likely try to rebound in G1 BC Juvenile. Latest Workout: 5f in 1:00.80 (32/48) at Santa Anita on 9-25. Comments: Distant 3rd in his 7-22 Saratoga debut (Strong Mandate 5th). Romped by 6-1/4 lengths as the 3-2 favorite at that same venue at 7f second time out on 8-31 (sloppy, sealed). Attended pace and retreated to 8th in Champagne. He should get better with age. Latest Workout: Breezed 4f in :51.41 (8/14) at Remington Park on 9-22. Comments: Coasted home by 4-1/4 lengths in his 5.5f Remington bow on 9-2 (89 BSF). Comments: Two races at Presque Isle with a clear place finish in his 5.5f bow on 8-15 and a 22-length romp at one mile on 9-17 (85 BSF). He was eased without an apparent excuse in the G3 Grey Stakes at Woodbine on Oct. 6. From Graham Motion’s Twitter account: @GrahamMotion – I’m afraid I can’t give an explanation for Give no Quarter’s poor performance at Woodbine today. He seems to have cooled out fine. 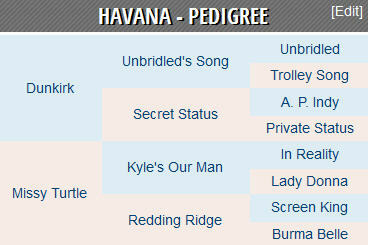 Havana’s hot freshman sire Dunkirk (Unbridled’s Song – Secret Status, by A.P. Indy) had a brief but productive 5-race career in 2009, beginning with a debut maiden win at Gulfstream Park in January. Dunkirk captured an allowance race in Florida second time out, and followed that up with a 2nd in the Florida Derby, a troubled 11th place finish in the Kentucky Derby, and a 2nd place effort in the Belmont Stakes. He suffered a condylar fracture to his left hind cannon bone during the Test of Champions and was unable to return to the races. He stands at Ashford Stud in Versailles, KY.
Dunkirk’s late sire Unbridled’s Song (Unbridled – Trolley Song, by Caro) captured the G1 Breeders’ Cup Juvenile in 1995 and won the G1 Florida Derby and G2 Wood Memorial as a sophomore. Plagued by tender feet, he finished 5th as the beaten favorite in the Kentucky Derby. As a stallion, Unbridled’s Song was responsible for more than 100 stakes winners including 2013 G1 Travers hero Will Take Charge. Unbridled’s Song’s sire Unbridled (Fappiano – Gana Facil, by Le Fabuleux) won the G1 Florida Derby, G1 Kentucky Derby, and G1 BC Classic in 1990. He earned more than $4.4 million on the racetrack and sired classic winners Grindstone, Red Bullet, and Empire Maker. Dunkirk’s mother Secret Status (by A.P. Indy) took the G1 Kentucky Oaks and G1 Mother Goose in 2000. Secret Status’s papa A.P. Indy won the G1 Hollywood Futurity in 1991 to end his juvenile season. In 1992, he captured the G2 San Rafael, G1 SA Derby, G2 Peter Pan, and G1 Belmont Stakes. He wrapped up his stellar career with a victory in the G1 BC Classic. A.P. Indy is a son of Triple Crown winner Seattle Slew, out of Secretariat mare Weekend Surprise. She was also the dam of 1990 Preakness winner Summer Squall. Havana’s mother Missy Turtle was a 4-time dirt sprint winner ($103,283 earnings) from 2000-04. Missy Turtle’s father Kyle’s Our Man (by In Reality) won the G3 Nashua as a juvenile in 1990 and the G2 Gotham as a 3yo in 1991. Missy Turtle’s mother Redding Ridge (by Screen King) won 7 of 37 starts and earned more than $164k, including wins in the 1988 Dearly Precious Stakes, and the 1989 Alma North Handicap and Dearly Precious Stakes. Havana has more speed than stamina influences in his pedigree, especially on the dam side. He could stay two turns, up to nine furlongs, and possibly beyond, if he learns to relax and better distribute his available energy.